Hawaii Native Status: Introduced. 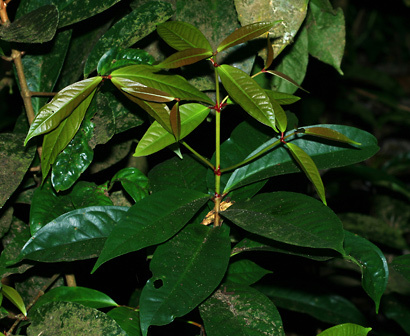 This naturalized Polynesian canoe plant is native to Malaysia and Indonesia. Flowering Season: Variable. These flowers were observed in January, while the fruits were observed in late May. Description: The flowers are in clusters on the older, woody branches and occasionally even on the trunk itself. 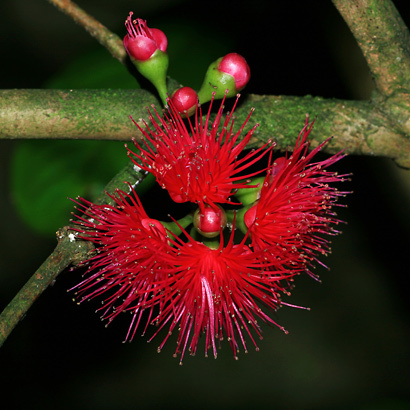 The individual flowers have 4 small, cupped, rounded, red, magenta, or rarely white petals and numerous red to cerise stamens tipped with tiny, yellow anthers. The flowers attract nectar-feeding birds. When in bloom, the larger trees will be surrounded by a colorful carpet of fallen stamens. The flowers are followed by pear-shaped, dimple-bottomed, up to 4 inch (10 cm) long, red, pink, white (rare), or streaked rose-red and white fruits with white, watery flesh and usually a single, large seed. The leaves have reddish petioles and are glossy dark green above, lighter green below, somewhat leathery, opposite, and elliptic to narrowly egg-shaped. The new leaves are pinkish bronze in color. The trunk is erect and has grayish brown bark. 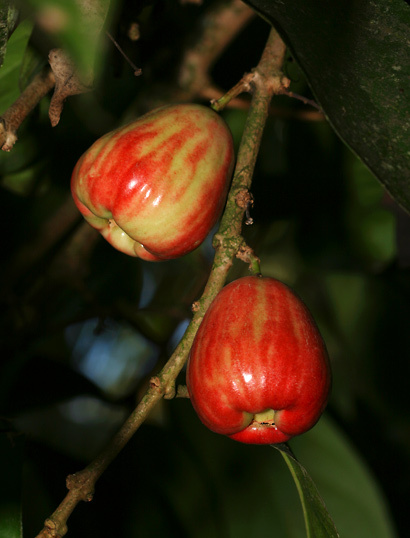 Despite its common name, Mountain Apple mainly grows in low elevation wet to mesic (moderately wet) windward forests and valleys here in Hawaii. These Mountain Apples were observed in the understory of a coastal forest. Although the fruits are very apple-like, Mountain Apples are not actually apples and are in a completely unrelated family. Canoe Plant – This useful food plant was originally brought to Hawaii by the ancient Polynesians in their canoes. The fruits were eaten and placed on hula alters. Various parts of the plant were used for medicinal purposes. 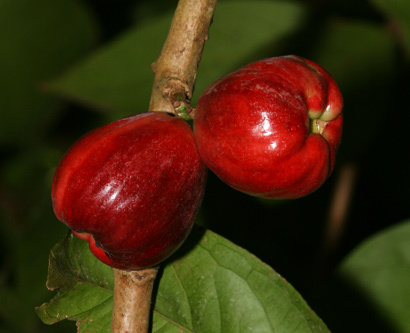 Brown dye was made from the inner bark and roots, and red dye was made from the fruit skins. The wood was used for building and carving. Edible – Like apples, the ripe fruits are edible either raw or cooked. Although the crisp, sweet, white, apple-like flesh is quite refreshing and has a lovely hint of rose essence, it lacks tartness and is less flavorful than that of a typical apple. The ripe fruits are picked from the tree (not the ground), and they don't last very long after being picked.